Now this was a pleasant surprise. When done right an anthology can be the best of all worlds, sadly it's not a very popular format these days so it's usually either done poorly or not at all. I think the last really good horror anthology was the original V/H/S and that was 7 years ago. A good bit of my horror fandom is owed to anthology films, Tales from the Darkside: The Movie was one of my favorites growing up, with Creepshow and The Twilight Zone coming in closely behind that, so I may have a bit of a soft spot when it comes to horror movies that adapt the format. Still, I don't think I'm out of line when I say that NIGHTMARE CINEMA looks amazing! Mickey Rourke plays a projectionit that traps people in a theater and forces them to live out their nightmares in the story that will bookend the movie, I knew the guy looked a bit off but DAMN is he straight up horrific here. I guess I didn't realize just how perfectly his face was suited for horror....and I mean that in the best of ways. The trailer also gives us quick clips of the 5 short films that will make up the group and they appear to run the gamut of horror sub-genres. You've got a ghost story, a campground killer, deformed mental hospital patients, a creepy gray person who's bending in all the wrong directions, there's something for everyone kids! 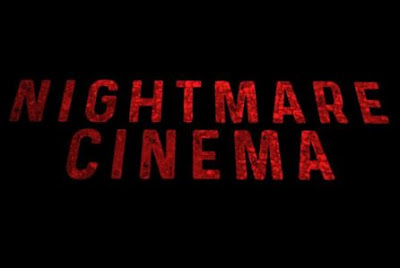 Check out the trailer below, NIGHTMARE CINEMA is slated for release on Valentine's Day 2019, no word on how wide that release will be though.